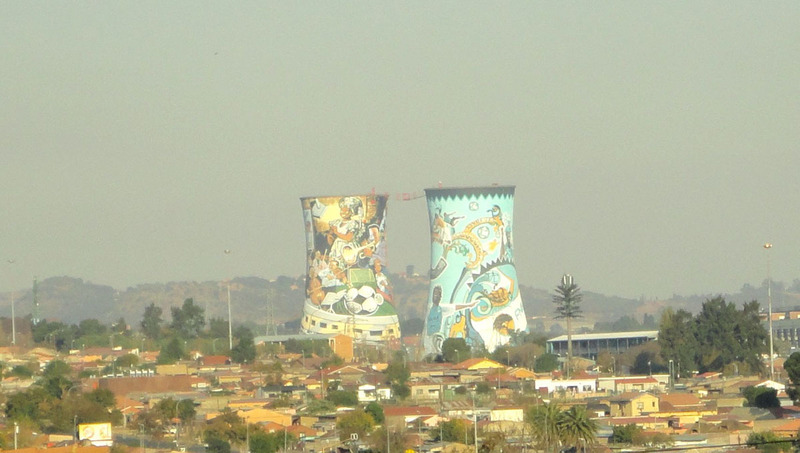 We booked our flights far in advance with very little idea of what we wanted to do in Johannesburg, assuming that once we started looking we’d have no trouble filling our 5 days with fun activities. In the end we were right and had a great time exploring, doing touristy stuff (and not so touristy stuff), and meeting people, but there were a few things we wish we had known ahead of time. I full heartedly believe in visiting a new place with as few expectations as possible because it is so easy to be blinded by how you think things should be that you can easily overlook cultural nuances and miss out on opportunities to meet new people and experience new things. That said, when you’re only going to be in a place for a week, as we were, having some idea of what to expect can ease the stress that comes with not being able to settle in and might help you to immerse yourself in more aspects (albeit more shallowly) of the area. So here’s our trip in a nutshell and a few notes below each day that you won’t find in The Lonely Planet, but I thought would have been good to know. The rest of the day consisted of eating at a couple of restaurants (I tried my first ostrich burger! ), walking down main street to look inside a few storefronts, napping for 5 hours when we realized that the last bit of energy we had used up wandering around Melville had only managed to kill 4 hours and now it was only 11:30AM, dinner, and finally calling it a day when the sun went down at 6PM. There is a good chance that the person helping you will expect payment after helping you (see Day 5). This doesn’t apply everywhere and no one at the airport seemed to expect us to pay them for helping to find a taxi, but if someone offers to carry your luggage to the taxi, walk you to a nearby museum, or even point you to the correct bus, they might ask you for a few rand afterwards. For better or worse, tourism has become a major source of income in Jo’burg and this is how a lot of people there make a living. If you’re asking for advice or directions, what you will get is probably the most convenient and safest option, but it will also be the most expensive and touristy. This was great when we were tired and didn’t want to figure out a complicated bus system to get to our hostel on the first day, but the taxis are quite expensive and the top tourist destinations keep you fairly well quarantined from many interesting and more “authentic” experiences. Bargaining is key. As a friend at my hostel explained, the asking price for most items and services is at least doubled (and sometimes even increased as much as 5x) for tourists (especially taxis — side note: always bargain for taxis, never use the meter). Obviously, don’t expect to get the same deal as a local, but if you don’t want to get totally ripped off and want to bargain, go for somewhere in the middle and, if you can, ask someone who is local how much they’d expect to pay for something first. After 17 hours of sleep, we woke up feeling refreshed and ready explore the city! We had heard about the Neighbourgoods Market, a cool little market open only on Saturdays, so we headed downtown to check it out. * The market was packed into a relatively small room with around 30 food vendors and a few hundred people wandering between them, eating, or just socializing. In the middle was one long table and upstairs was an open patio and a few really expensive crafts vendors. After looking at all of the options, we both settled on paella (a delicious shellfish and rice dish from Spain) which was being cooked in the largest paella pans I’ve ever seen. Before leaving the market, we met three friendly guys living in Jo’burg who decided to make us a list of everything we needed to do in the city before we left. Sounds like an awesome opportunity right? Well, making the list was a lot of fun, but actually doing any of the items would have cleaned out our bank accounts and included eating at the restaurant that Obama apparently eats at when he visits and bungee jumping off of an old nuclear power plant tower. Leaving the market, it was a beautiful day (as was every day) so we decided to just explore. We crossed the Mandela bridge and eventually found ourselves at the steps of the “Africa” museum. It had a phenomenal and powerful photography exhibit on the apartheid and some interesting traditional southern African tools and fabrics. I think it’s a good idea to have the exact address (or at least the name of the neighborhood) for anywhere you want to go in a taxi. Despite being seemingly touristy attractions, neither of our taxi drivers knew where either of the markets we went to were located and it took us awhile to find someone who knew and could tell the taxi driver. We accidentally slept in until around 11. Wups! Well, we skipped breakfast and took off to another weekly market, called Arts on Main, way on the opposite side of Johannesburg. Once we found the market (and that took a good hour of searching) it turned out to be much larger with a wide variety of food vendors on the first floor, a ton of local artists on the second floor, and seating in the courtyard. We decided to skip part of the market, since it was already getting late, and found a taxi* to the Johannesburg Art Gallery which is only a mile or so away. As we approached the gallery, we were shocked by how drastically our surroundings had changed in the matter of a few blocks. The contrast was unbelievable, but really made us aware of how one-sided and tourist sanitized our trip had been thus far. The art gallery was a very large stone structure surrounded on one side by a park filled with homeless people and, on the other, dirty streets filled with street vendors who had laid their goods out on the sidewalk, people getting their haircut on corners, and mini-buses (which we would later find out is how everyone travels who isn’t white or middle-class). So the market isn’t far from the art gallery, but I honestly don’t know how safe it would be to walk if you decided to do that; at the least you’d get a lot of stares. The Art Gallery was awesome, but quite small. They’re doing a ton of renovations and opening a new area of it very soon so it didn’t take very long to walk through (maybe an hour at most). However, we got incredibly lucky and just happened to be there on the day of the opening for the new exhibit! We got free food, music, and an interesting talk by an art critic. We also realized, at about 4 in the afternoon, that it was my birthday! Traveling totally screws up your sense of time… It was too late and we were too tired to plan something special so we just decided to celebrate the next day. If you make it to Johannesburg and aren’t sure what to do, definitely check out the Art Gallery, but unless you plan to go when there’s an opening, don’t plan to spend more than an hour or two. * The one reason I could find that you would need a cellphone in Johannesburg for 5 days is so that you can call taxis. I still don’t think it’d be worth it, but sometimes it can be really hard to find them, especially when you aren’t downtown. If you don’t have a phone, what you SHOULDN’T do is stand next to the road and try to wave down an empty taxi. At least, we couldn’t get that to work. Instead, just ask lots of people, pool the answers, and go to wherever the majority of people told you to find a taxi (repeat until you find a taxi). Damn was this a good day. To celebrate my birthday, we decided to visit the Lion Park! We paid the $30 per person fee for an hour-long guided tour (for only $20 you can drive your own car, but that sounds terrifying and the tour guide ended up being really good anyway) and boarded a small bus with fencing and metal bars on all sides to keep you from getting eaten. 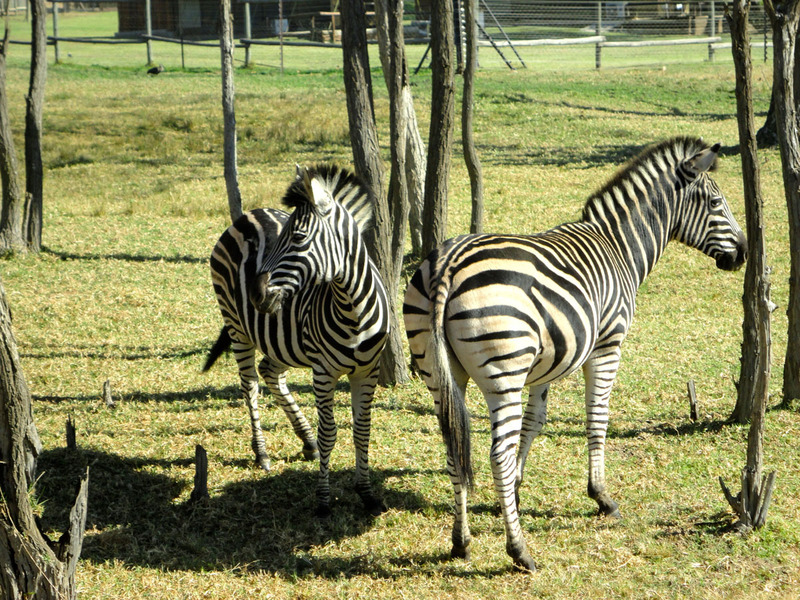 First we saw zebra,* followed by giraffe, impala, bison, and a ton of other cool, non-predatorial savanna animals. Next, we drove through a gate into the lion/cheetah/wild dog areas. These areas are fairly small and there are plenty of dirt roads which allowed us to stop the bus within 15 feet of a pride of 7 lions. We just sat there and watched for awhile, until suddenly and without warning the male lion lifted its head and gave out a huge roar. Apparently, you can hear a full grown male lion’s roar from 5 miles away so you can only imagine that when the other 6 females joined in, and they were all roaring in unison, and causing the entire bus to shake it was a pretty incredible experience. Just Leslie petting a lion cub. We saved the Apartheid museum, Nelson Mandela’s and Desmond Tutu’s houses, mini-buses, and Soweto (a neighborhood with the highest population density in the city as a result of the apartheid laws and the displacing and segregating of black families throughout most of the 1900s) for our last day. I’m not sure if this was intentional, but I’m glad we saved these for last because it put a lot of our experiences into a new perspective. 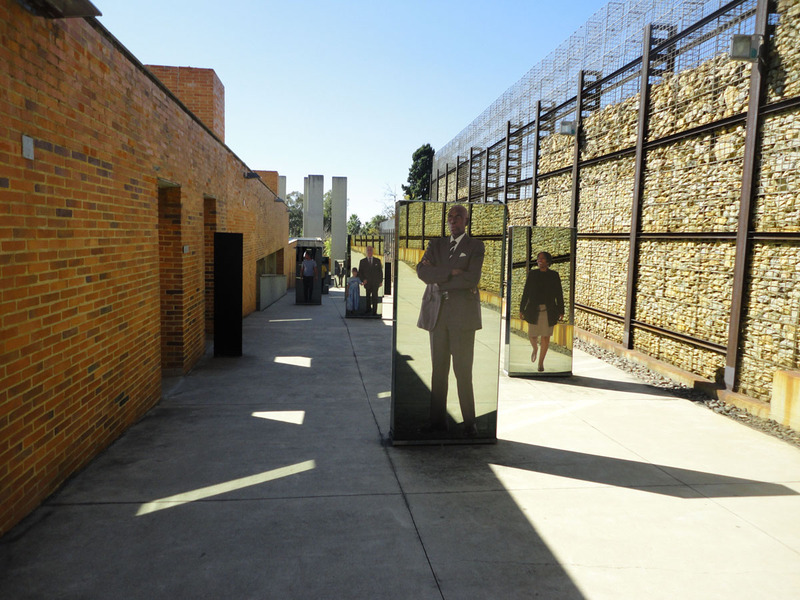 The Apartheid museum is a must see and, if we had had more energy, we could have easily spent more than the 4 hours we chose to spend. I could talk about the museum for pages, but I’ll just give you a brief highlight: the museum starts out with everyone being randomly assigned to the status of either black or white status and separated for the first exhibit. This exhibit focused on the arbitrary way that the government ascribed many people, especially those with mixed parents, their race and how that assigning dictated everything from whether you would get a job to where you could live and your value as a human being. 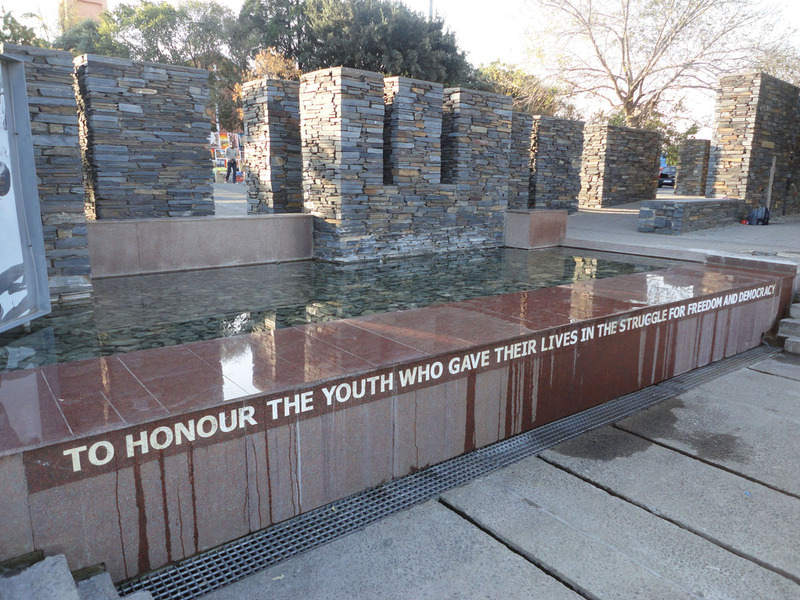 At the end of the museum was also an exhibit highlighting the ongoing struggle for equality in South Africa. Next, we left the museum and continued West. 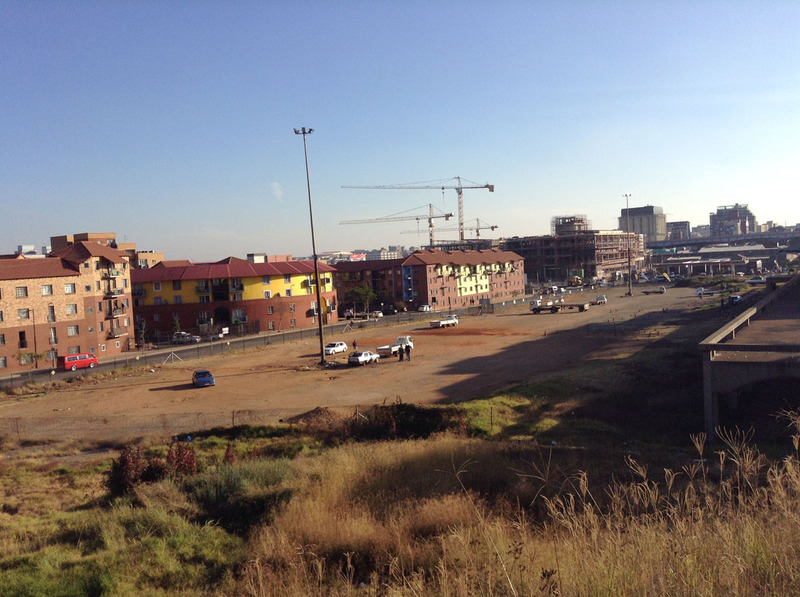 After arriving in the area of Soweto known as Orlando West, we were quickly adopted by a man wearing an orange vest who began showing us around. 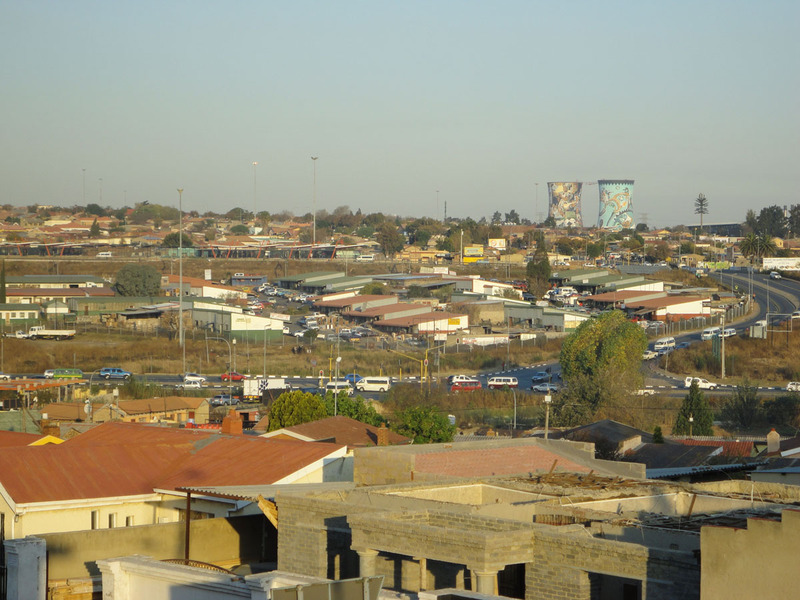 As he enthusiastically explained, Orlando (and many other parts of Soweto) was no longer dangerous and had become a huge tourist destination. It certainly looked very safe and we saw many tourist groups walking around, but there was something about it all that bothered me. The entire drive here had been through extremely impoverished and predominantly black areas and, while I believe that tourism has created many new and much needed jobs, I couldn’t help but wonder who is actually benefitting from the tourism market, how much of Jo’burg is still segregated, and how of the racial disparity has been covered up by these sanitized and freshly perfumed tourist traps. After a long and tiring day, we waved down a mini-bus and started our journey home. We had been taking the mini-bus system instead of taxis all day and had not only saved about $30 each, we had also talked to more people and seen more of Jo’burg than the rest of the trip combined. There is no website or map or guide to the mini-buses and there is certainly no one to ensure that the vehicles are in decent shape or that the drivers drive safely. Yet, this is how hundreds of thousands of people who can’t afford taxis or their own car get to work, school, and around the city everyday. We got a LOT of puzzled looks and questions while trying to use the buses and one man even announced to the bus that “the white people will be paying everyone’s fairs today!” (we didn’t actually have to, he was joking), but it was without a doubt one of the highlights of the trip. If you decide to take the mini-buses when you visit, know that people will be surprised and confused. To wave down a bus, you hold out the number of fingers for the bus route you are taking and wait for the appropriate bus to stop. At least that’s how it’s supposed to work. Every time I tried, the driver would look at me strangely as he approached and not slow down until the last second when he’d screech to a halt once he had come to terms with the fact that we wanted to ride his bus. We’d also have to answer a few questions before boarding the bus to confirm that we knew where we were going or at least try to alleviate the driver’s worry that we would most certainly get lost and die if we boarded the bus. Now on the bus, each row of people (there were 4 including the driver’s and 4 people in each row = 16 people total) would collect the correct fares (which varied depending on the distance you were traveling but wasn’t written down anywhere) and pass the money to the seat in front of them, announcing something like “2 for 8, 1 for 7, 1 for 7.50.” This next seat would then repeat the message and pass that money to the seat in front of them. Eventually, all of the money and directions would reach the front seat where some unlucky passenger would then figure out the change for each group and send the change back (sometimes the driver did the change but that was always pretty scary). But if that doesn’t sound complicated enough, to make matters worse, the mini-buses never had any change! Which meant that the temporary accountant had to make change from the amounts passed forward. Believe it or not, everyone always managed to get the right change in the end (though Leslie or I were never forced to sit in the front).